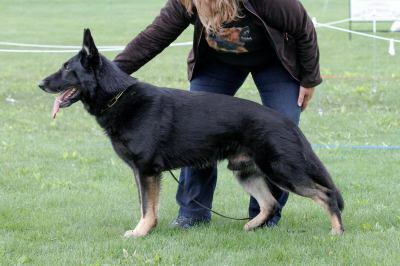 Arko is an upper medium sized male. He has super high ball and food drive. He demonstrates power with full crushing grips in protection. On the obedience field, he showcases his drive with a very lively and fast paced routine. Arko is many times IPO3, most of those coming from national level trials. He received his first interntional IPO3 tite in June of 2015 as a member of the WUSV Universal Seiger Team (Team USA).